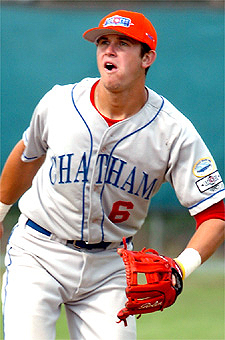 Chatham -- Although many Chatham Athletic players posted mind-boggling numbers this summer, Evan Longoria- a legitimate Triple-crown candidate for much of the year- was the player that stood out the most. Thus, it is only fitting that he was the recipient of the Pat Sorenti Award for Most Valuable Player. To win the triple crown, a player must finish the season as the league leader in the three major batting categories: average, home runs and RBI. Needless to say, only the very best hitters are able to accomplish such a feat; the last MLB player to turn the trick was Carl Yastrzemski of the Boston Red Sox way back in 1967 when he hit .326 with 44 home runs and 121 RBI. Although Longoria (Long Beach State) led the Cape League in both home runs (8) and RBI (35), he fell out of contention in the batting average category, finishing with a .299 average after spending much of the season in the top five of this category as well. Even more impressive about these gaudy numbers is the fact that the Cape is known as a pitcher's league. The combination of wooden bats and the country’s top pitchers usually results in hitters’ numbers falling below their college statistics. Longoria, a native of Downey, Calif., was chosen as the Coca Cola player of the week on two separate occasions this season, joining Chatham teammate Derrick Lutz as the only repeat winners. During a six-game stretch between June 20 and June 26,Longoria hit .440, going 11-for-25 at the plate. He added two home runs, five RBIs, three doubles and had an amazing slugging percentage over .800.Then, during the week of July 11-17, Longoria notched three home runs and 11 RBI over a span of just 30 at-bats. His batting average for the week was .400, while his slugging percentage was .883. As a team, Chatham finished head and shoulders above the rest of the league in batting, with an overall team average of .273. The next closest squad in team batting finished with a .246 average, almost 30 percentage points lower. The A’s also led in hits (406) and home runs (32). Longoria anchored the middle of the powerful A’s lineup, finishing third overall league-wide in hits with 49, first with a .500 slugging percentage and tied for first with teammate Baron Frost in extra base hits with 16.Longoria is a very talented defensive player, capable of playing anywhere in the infield.